The photos show the Metaline of Fort Benton, Idaho. The mystery is where on Pend Oreille (Idaho or Washington) these photos were taken. If it's Box Canyon, as some believe, then the current seems to flow in the wrong direction. One possible answer is that since the photo was taken, a dam has reconfigured this section of the river. Somewhere in the vicinity of the town of Newport which sounds like it was once in Idaho then the state line shifted and put it in Washington. Treacherous waters to navigate. The boat appeared to be winching itself upstream against the current. Am attaching the full view and a detail of the boat. Maybe some of your old correspondence with interested parties is in one of your old computers if their hard drives were preserved. Metaline sternwheeler that ran on the Pend Oreille River (winding through the states of Washington & Idaho). TO READ THE DISCUSSION about this steamboat, the history of the canyon, the current of the water, and speculation about what is really going on, scroll down. If you have any insights into this controversy, please email Steamboats.com. See below for larger version of this photo. Steamboats.com thanks Dave Thomson for supplying a high resolution scan of the photo. Latest posting October 2013 (scroll to bottom of the page). John - Thanks for the link, it came up fine. I was wondering if the Captains Miller were a Fort Benton based corporation and if that was the reason they assigned the name as the home port of the Metaline. I've been hoping that someone recognized the vantage point that the photo was taken from so a contemporary picture could be taken of the same view. Would be fun to compare the two. Isn't there a dam along that stretch of river now? yours: - Isn't there a dam along that stretch of river now? Yes. It's a hydro electric plant right below the train crossing bridge at that point. Faith McClenny of the Pend Oreille County Historical Society sent me all available photos of the eastern walls of the river at that area. There were none that suggested a match with your picture unfortunately. The quality of the society pictures was not too good, however. yours: - I've been hoping that someone recognized the vantage point that the photo was taken from so a contemporary picture could be taken of the same view. Would be fun to compare the two. I have been over the road on the west bank many times and have a feeling for where the source point of the picture would have been. Again nothing matches. Incidentally, in 1950 I owned 40 acres directly above and east of the picture so I am familiar with it. In a court of law, I would have a loser. Judge, nothing looks right to me, but I can't prove anything. He would throw the case out !! Good to hear from you. If anything new turns up you can be assured that you will be the first to know. Do you think the negative was flopped? I don't see how since the name of the boat reads correctly. I thought Barker's account sounded reasonable with the sternwheeler Metaline's history. The only mystery I see is why is the "OF FORT BENTON" line under the boat's name at the stern. Apparently there's some doubt as to whether it's Box Canyon or not but without a contemporary photo taken from the same location it's difficult to confirm. The photo is scary . . . one can believe that one man drowned during the endeavor, if it is the same trip. Since the story dates way back to '54 and was revised in '61 I should think it would be all right to post it on along with the link. A hydroelectric dam was built in Box Canyon in '52 and it probably altered the landscape to some degree which may be why nobody's come up with a modern view which looks like it did in the 1890's, depends a lot on whether the dam built above or below where the photo was taken. It could have created a lake where there used to be rapids or changed the depth of the river where this took place. Ooky Spooky story, I agree! A man wrote in with a possible answer to John Locke's mystery boat question, regarding the current. What do you think? An intriguing possibility . . . am still wondering how a boat claiming Fort Benton on the Missouri River as its home port got so far removed from that territory unless its owners hailed from there and wanted that association to be advertised. I see that Metaline is some sort of herb that health food stores sell in capsules as a means to "maintain healthy levels of resistance to metals." Perhaps it's common to the Pacific Northwest and thus the name has been attached to places on both sides of the US/Canadian border. The METALINE FALLS are on the Pend Oreille (pronounced Pond-er-ray), and a town called Metaline was incorporated near there in 1948. Believe I have at least one book about B.C. rivers and boats here someplace, will have to look for reference to the Vancouver Andy's proposed solution. Nori, Thanks for the lead from Andrew. I'll snoop the BC Archives and see if any of the river shots have some similarity to the Box Canyon area. I FOUND the Volante steamer picture and hate to send it to you because I have no idea where I picked it up or even if it is from this area (PO River). I will send you the McKay Landing picture. It also has an unidentified small steamer on the left. I think that it may have been one of three that were used as tugs near the end of the period. I have a picture of the Clairfield being moved and it is of the smaller type. You help is more appreciated than you can imagine. The McKay Landing picture means a lot to me because D.G.McKay was my grand dad. I have scant info on him. Use anything I send you at your discretion. Two pics coming up I hope. Here's Deborah Cribbs' response from the Mercantile . . . "a work in progress." I opened Pandora's Box when I unleashed that photo upon the world. This would make a nice case for the Cable show "History Detectives" . . . I did receive your phone message. I talked with Bette and besides looking in a few collections, there is not a way to hunt the photo or the article, down easily. I will let you know what I find out after I check out of few collections. A request right now is taking more than the usual 2-3 weeks, but I will try to get back in touch with you as soon as possible. Let me know if you have any questions or concerns in the meantime. I am Peggie Garske Ward, John Locke's cousin. My family, Frank and Carrie Garske raised my four siblings, then me, a generation later, on the Pend Oreille River in Ione, about six miles south of Box Canyon. That river flows north, however, with all the dams I do not know if there is any moving water remaining. My brother (deceased last year at age 85) said this picture is at Box Canyon and I agree. The Pend Oreille river flowed north which explains the movement of the water and the Metaline in this picture being winched back up the river towards Ione on the west side of the river. The picture was taken from the east side of the river, most likely in an area below the existing train trestle. My brother hunted with bow and arrow in this area for several years, late 1930's, and the rings were still intact during those years. I explored the area on the west side but was never comfortable crossing on the train trestle. Like Z Canyon, which forced the river to an incredible 18 feet across (but is now Boundary Dam notable in Kevin Costner's movie, The Postman), Box Canyon had a spectacular view and gave wonder to the mechanics of being on a boat that was going either direction. The current dam is constructed below, to the right, downstream of the Metaline vessel on the town of Metaline side. I would imagine that any remaining rings would have been removed from the cliffs during the dam construction to protect possible liability from divers looking for them in the newly formed lake. Charles Barker's information was very informative and interesting. He and my father, Frank Garske who designed and built the ferry across the river at Ione in the early 1900's, were good friends and county commissioners during the 1940's. The "comparative" photo showing the constructed dam and the train trestle, is looking east, and the rock wall would be on the opposite side of the river from the vessel. I hope this might be informative. I love that country and its Four Seasons, and have been back several times to reminisce. The pictures my parents have of Ione in the very early 1900's, good grief--over 100 years ago!! !--are so incredible. Thank you for giving me the opportunity to perhaps shed a bit more light on this "mystery". John Locke sent me Peggie Ward's contribution to the METALINE discussion. Her theory is the most credible one I've heard so far . . .
Hi Nori, Have been checking the British Columbia leads and the Yukon is a possibility. Peggie Garske Ward added a new twist to the interpretation of the Box Canyon picture. I forwarded her comments to Dave and he was happy to get them. 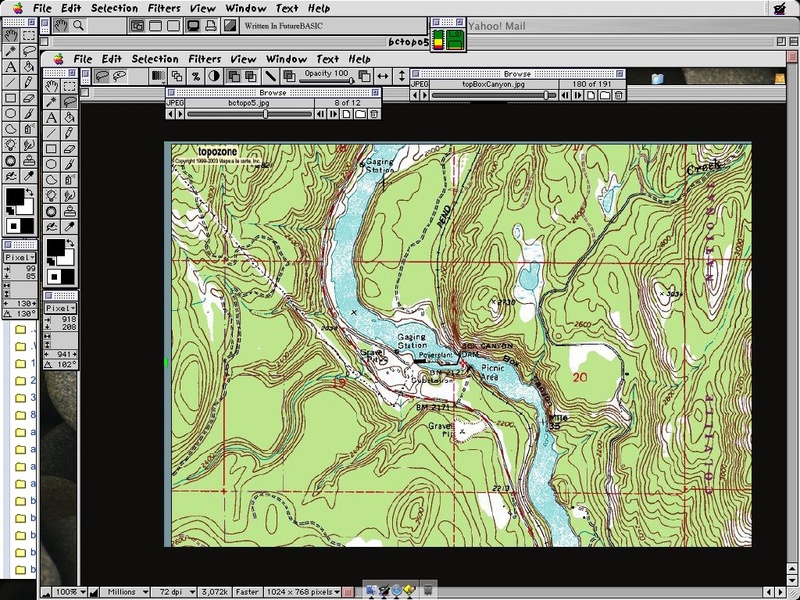 I am looking for old topo maps of the Pend Oreille River south of the trestle that show the west side of the river. From memories of driving the highway along here, I don't recall any steep banks which are in the background of the mystery picture. Thanks again for posting (Thomson's) picture and getting responses. Apparently the Metaline is on the bottom of the river at Albeni Falls. It would be great if someone brought up what's left. The captain's log would answer some questions ! Here is Swift's mention of the Metaline in the WJ from Ruth Ferris' files at the Mercantile Library courtesy of Deborah Cribbs (see below). Not a great deal here except that he reckoned the boat was built at Newport, Idaho. Why Fort Benton was given as the Metaline's home port still remains to be explained. The guys who put up the dough for the boat may have had their corporate offices in Ft. Benton. Some time ago, Dave Thomson of Sun Valley, Calif., who has found some very interesting river material, sent us the accompanying picture that has intrigued us ever since. He writes: "The Metaline of Fort Benton, it says over the paddle wheel. Doesn't look like the Missouri River. Is it a tributary or even the Columbia River?" It certainly isn't the Missouri, at least not that part of the Missouri known for steamboating in the normal sense of the word. 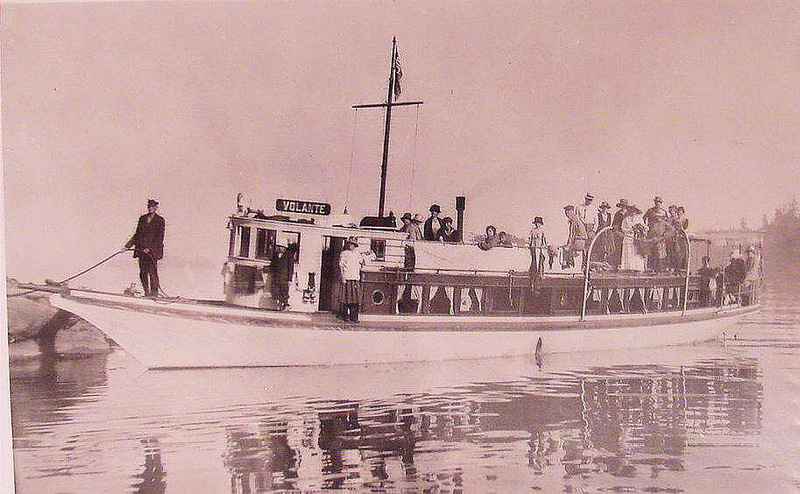 The Metaline was built at Newport, Idaho, in 1895. She was 108 by 17.8 by 4.9 ft., was registered at 218 g.t. and 159 n.t., and had indicated horsepower of 222. The Metaline is last shown in the List of Merchant Vessels in 1899. 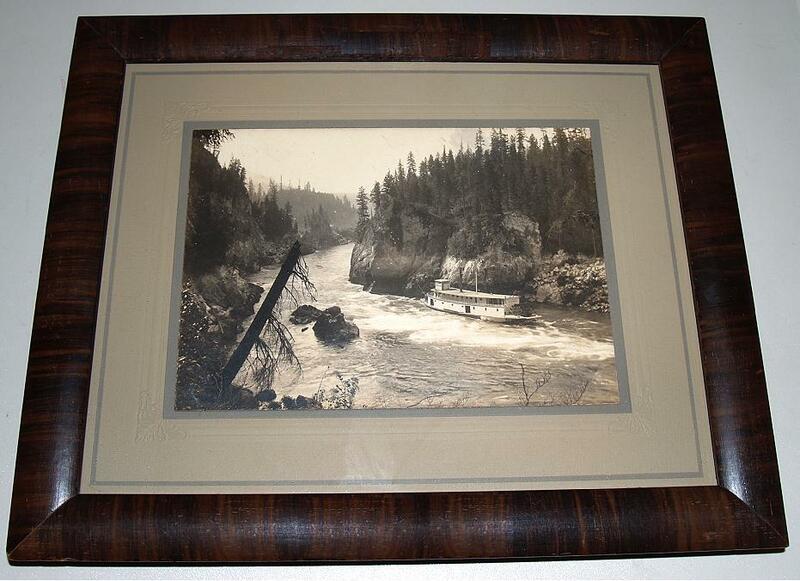 My METALINE photo was not from a historical file keeper, it is an original 5 X 7 albumen print of the period mounted to an 8 X 10 embossed card, possibly made by the original photographer's studio for sale to interested parties along the Coeur d'Alene River as well as nationally. I bought the mounted photo from a dealer at an antique photo show in the '80's and put it in an antique frame. Hi Nori, MANY thanks for your updates and organization of the Box Canyon story. I am working on getting the SOURCE of the picture. FAITH MCCLENNY OF POCHS OUR HISTORICAL SOCIETY has a copy of a very similar Box Canyon picture (To Thomson's) She titled it the Metaline in Box Canyon. I expect an anwer from her is a short while. Dave said his copy came from a historical file keeper, but I don't think that there were further details. The picture has been floating around on the net for some time and I had seen it before but didn't recognize the problems. A very good friend of mine, who has passed away had comments on it showing the difficulties of getting through Box Canyon. Neither of us could read the Ft Benton on it. I want you to know that your efforts on this are very much appreciated. This is the toughest clinker I have had and frankly I am amazed that there has been this much response. I will add your latest here for my benefit when I go through this again at a later date. I feel fortunate to have your expertise at hand. I need the above list !! The date the Metaline was built and where is invaluable Newport could be a source of more records. The Selkirk Sun of Metaline Falls might have some leads. I have pictures of the landing area in Metaline Falls. They show gunny sacks piled up so there was some volume being moved. I'll try Nolan Lewis of Ione for leads. He wrote an Ione history and Tony Bamonte should have pointers. AND Marvel Smith of the lions promised me to contact an oldtimer about the rings. Last a final thanks. We never know what may come up. A PS. DO you pronounce your name mooseter or muster ??? John: It surprised me too!! This must be the most extensive collection of informationabout the photo anywhere in the world. re. my name. We pronounce it Muster, rhymes with bluster. What an amazing photo! Wow, are they using cables embedded in the wall to pull the boat up stream? I have forwarded your inquiry and the emails containing the photo attachments to both our Photo Archives as well as to one of our historians. I did a quick search for any Montana reference to the Metaline yesterday, but was not able to find anything. Give me a time to come up with an email for someone in Fort Benton, as that may be where you need to go with this. Thank you for this wonderful historical mystery!! Hi, The Idaho Historical Society referred me to you. I was looking for help identifying the steamship Metaline built it Newport WA in 1896. We have a picture of it in Box Canyon (near Metaline Falls WA) and on the stern the lettering FT BENTON can be made out. I will send you a link that shows this. The picture itself has turned out to be a real puzzler because close scrutiny raises doubts that it is actually the Washington Box Canyon. I am happy to pay any fees incurred. My MAC doesn't get thru to your research tips ... hangs up part waythrough. Will send the link next. Hi Nori, More filler for your hard drive ! This is a good reference for the shore line heigths. Notice that the west banks are low compared to the east. If the original pic was taken from the opposite side, then the background for it would show HIGH banks which is not the case. I have tried many sight lines to get a placement on the site where the original pic was taken and can't find a correlation. My conclusion is that the picture is not of the Metaline Falls area of Box Canyon. It could be of another area of the Pend Oreille River possibly. Until there is more information it seems to be a stand off for me. NEW NEWS about this controversy!! MORE FEEDBACK about this controversy!! Hi Nori, I read the last posting on our mystery picture and can't remember if I sent you Bamonte's take on the problem. ...So here it is again in case I didn't send it the first time. My take also is that the picture we have doesn't show a boat in the Metaline Falls area Box Canyon, even though POHS has it labeled that way. 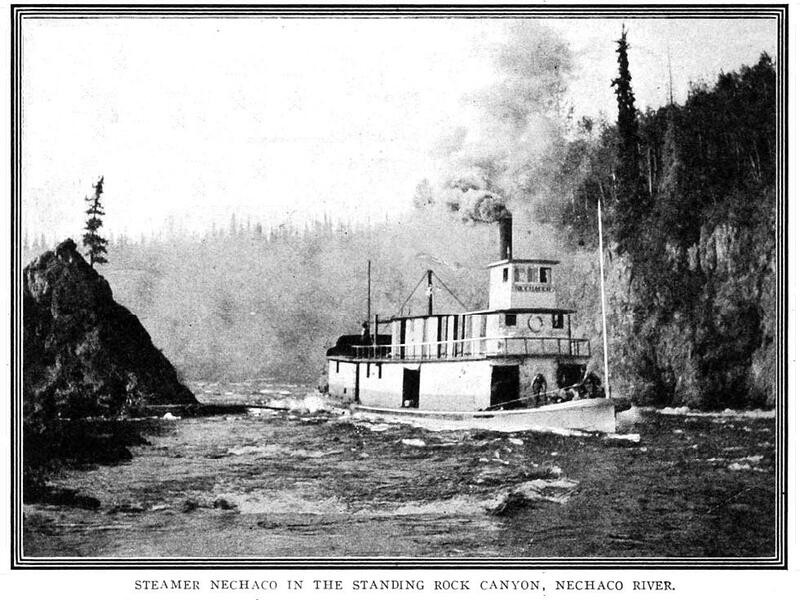 The Steamer Metaline in the photo was never on the Pend Oreille River and the scenery in the background is not of the box canyon. I remember the Box Canyon both before and after the dam. When I was in the third grade my friend's father worked on that dam. I also worked on Boundary Dam when I got out of the army and travelled that river numerous times by boat in the 1980s. I had a large boat and river property on the P.O.. That photo is not in that area. As the sheriff of the county I also traveled the river many times in search of drowing victims so am quite familiar with its curves and banks. We have three excellent photos of the Steamer Metaline on the Pend Oreille River, plus photos of every major boat that plied its trade on that river. We wrote a special chapter in our PO history book regarding the river and steamboats. Hope this helps. This link starts with the PICTURE.. and Nori records a ton of other info. Susan Dechants site has also posted the picture. Editor's note: here is the latest evidence in this mystery . . . . 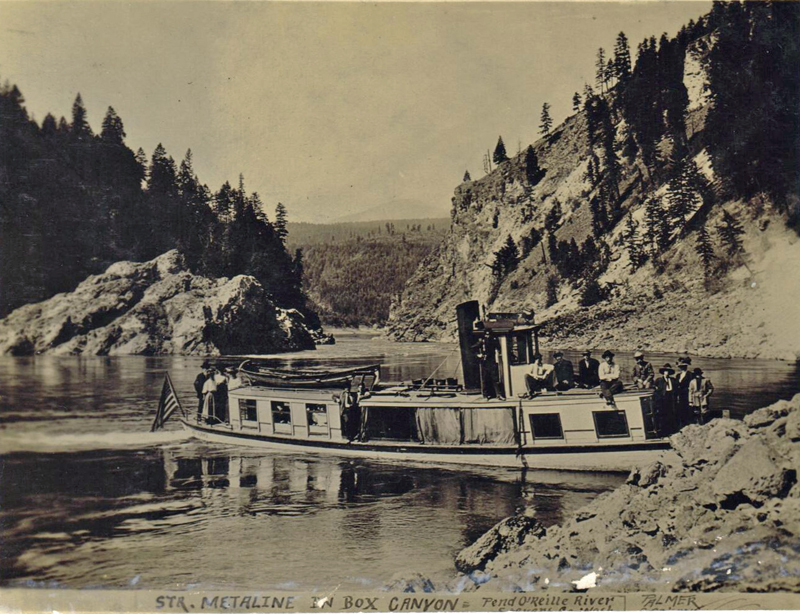 The bulk of on-line comments suggests that Box Canyon is the locale for that photo of the Steamer Metaline as it lines itself up the Pend Oreille. I agree. I've spent enough time scrambling around in Box Canyon to recognize it in the photo. It was taken from the east side of the river, where it makes a 60 degree bend towards the west, and looks across and upriver towards the head of the canyon, which is defined by that jagged line of rocks along the left side of the river at the top of the photo. Just to the left of the Metaline, and above it, at the break of the cliff, is a protruding point which remains conspicuous today. That part of the canyon looks slightly different today, in part because of a higher water level and absence of whitewater as a result of Box Canyon Dam. But there was also some drilling and blasting between 1899 and 1906, by U. S. Army Corps of Engineer crews, that removed the boulders in the river to the left of the Metaline, and altered the appearance of the jagged rocks at the head of the canyon. A July 1895 article in the Spokane Spokesman-Review described the Metaline's ordeal in Box Canyon. If you like, I could snail mail you a copy. . . . I know you would just love to find out why the name "Fort Benton" appears on the back of the Metaline. Me, too. Unfortunately, I haven't a clue how that came about. . . I found your website with its discussion about the steamer Metaline in Box Canyon on the PendOreille, while researching an interesting photo postcard among some old photos I just acquired.A scan is attached. I had never even heard of the Pend Oreille river until I saw this card. As you may be able to see, it's inscribed "Str. Metaline in Box Canyon, Pend Oreille River" - below, partially cut off, I think it says "Spokane Co. Wash" (which would seem to be incorrect, as it presumably would be Pend Oreille Co., unless that county didn't exist at the time). Obviously, it's a different boat (and a much ruder one) that the "Metaline of Ft. Benton" in the picture on your website, but the location looks like it might be just a bit downstream, the cliff in the background look a lot like the cliff to which the boat in the other picture is tied. 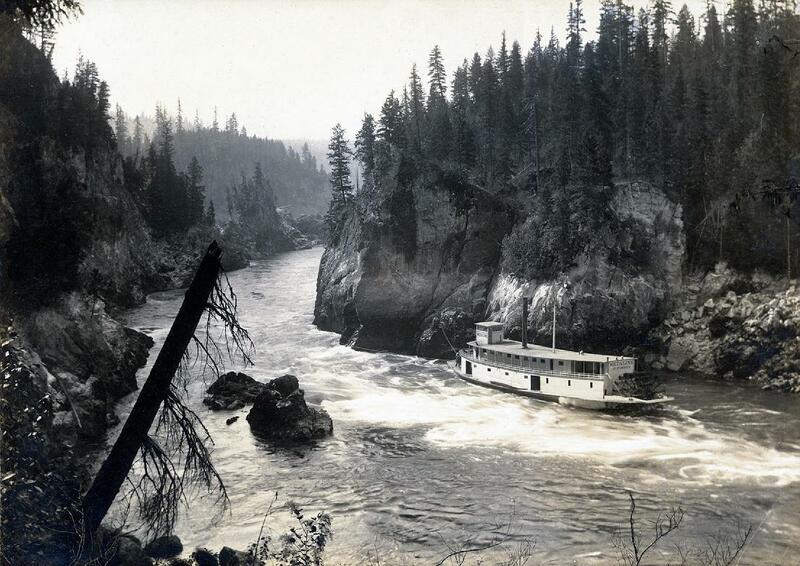 So is mine misidentified, or was "Metaline" a popular name for steamboats on this river? My card is unused and undated, but I'm guessing it's in the 1900-1915 era, when picture postards first became legal in the mails, and the "real photo postcards" were very popular. The photo, of course, could be a bit older. P.S. - Notice you have links about the Delta Queen on your website. My wife and I were fortunate to take a trip on the DQ during its last season in '08. We participated in a big "Save the Delta Queen" rally in Marietta - but unfortunately, it didn't happen - guess we'll never see it on the river again (sigh). Editor's Note: Never give up on the Delta Queen. 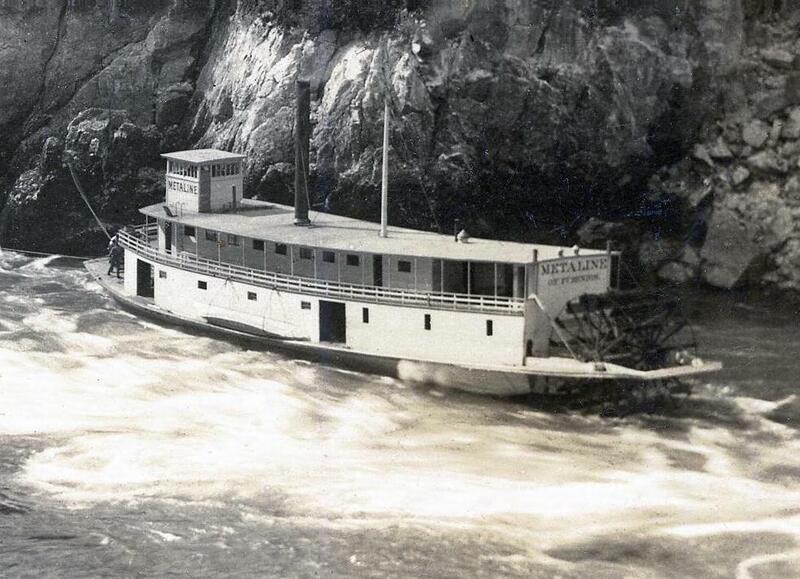 I just came across your steamboats.com web site regarding a mystery photograph of the steamer Metaline on the Pend Oreille River in Washington State. At the same time I was also looking at Google Earth. When I looked at the photograph I tried to figure out where it could have been taken from and which direction by comparing it with the global map of the river. If I were to guess the location, I would place the photographer on the east side of the river as Peggie Ward suggested and that the steamboat is located exactly 3.8 miles upstream (south) of the Box Canyon Dam and is pointed southeast. It is resting on the west side of the river. After the river makes this bend, it flows directly from the south. The landscape in the photo looks exactly like it does from the overhead view from space. The rocks jutting up in the center of the picture are now islands in the river being created by the backwater from the dam. After the narrow area of the river where the boat is, the canyon opens up as you go south past the rock outcroppings and that is what it looks like on Google Earth. This probably has already been determined but not explained in this manner. I don't think the photo was taken with the boat at the point where Box Canyon Dam is now located which I think is where the mystery seems to have been heading. It is fun trying to solve mysteries isn't it? I enclosed another view of what I believe to be the source location of the photograph of the Metaline in Box Canyon. This time I turned the earth and now south is at the top of the page and correlates with the photograph better. Of course the river and canyon were narrower in the photo without the backwater from the dam. I look forward to seeing it on your web site and am interested in any comments from your other viewers. No reply necessary. Have a good day. Editor's note: The Google Map screen captures ought to enlighten this discussion!Thank you for sending, Jerry!